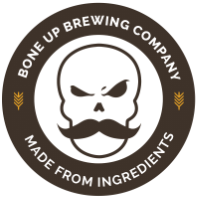 Bar Snacks - Bone Up Brewing Co.
We've got a small but tasty selection of food available in the taproom - warm toasty stuff, plus other small snacks (we have a rotating selection of delicacies such as “cheez-flavored” crackers, fruit snacks in the shapes of unpopular cartoon characters, "irregular" chips, etc), and so on. We also play host to a rotating variety of local vendor pop-ups - we do tasty things like pizza, pierogi, burgers, street food, cheese, waffles, and more! Check out our upcoming events or follow us on social media for the latest updates on that front! From scratch pork sausage, served with stoneground mustard and pickled veg on a toasty bun. Classic bierhall-style pretzel, comes with your choice of creamy mustard: classic tangy, smoky maple, or jalapeno. South American inspired, locally made with a flaky pastry dough, filled with spinach and cheese! Tender and thin and oh-so-tasty, there's a reason the people who make it liken it to prosciutto. Classic-style jerky, which means it's a little chewier and leanin' on the salty side, just like that one weird uncle of yours used to make!